On Southern California’s largemouth-bass lakes, fishing success cycles in line with declining or improving bass populations, and 2018 saw both the fisheries and the fishing definitely on the upswing. Trophy bass hit the scales, both officially and unofficially, at many of the region’s best known bass lakes. Occasionally, you can catch a glimpse of one on social media, which is a good place to go for updated bass-fishing reports from the guys that are out there all the time and often reveal which lakes are hot … or not. Out east in San Diego County, about 8 miles north of Barrett Junction, the famous pay-to-play Lake Barrett slowly rises every year, but it doesn’t take much water to fill it up. As the lake annually spreads back into both arms, the largemouths follow. When it first opens in May, you can catch a lot more fish on Barrett than any other lake in Southern California. After being closed since the end of September, a couple anglers can easily enjoy 50- to 100-fish days, something simply unheard of on any other impoundment. Even after the initial bite slows down, this lake still will average more fish per angler than almost any other lake in the Southland. Key to finding Barrett’s best largemouths is fishing among the sticks and brush in the shallows. Because the lake level fluctuates, and because the lake opens right after spring rains usually fall, plenty of cover provides refuge and ambush points for the bass. The all-time favorite bass bait among Barrett’s anglers is the Yamamoto Senko in almost any color. Toss it in the brush and hang on! If you’re new to Barrett’s bass fishing, go to any shoreline and start fishing. You will catch bass. Spinnerbaits run through the plentiful shoreline brush will score as well and often it’s hard to put it down as the bite continues through the day. As the year progresses, the largemouths school up and start to chase shad around the lake. Topwater action will increase, along with the jerkbait and crankbait bite. One great thing about this lake: Almost any angler of any level of expertise can catch fish here and a lot of them. If you need to practice with a particular lure you might not hold confidence in, this is the place to throw it. 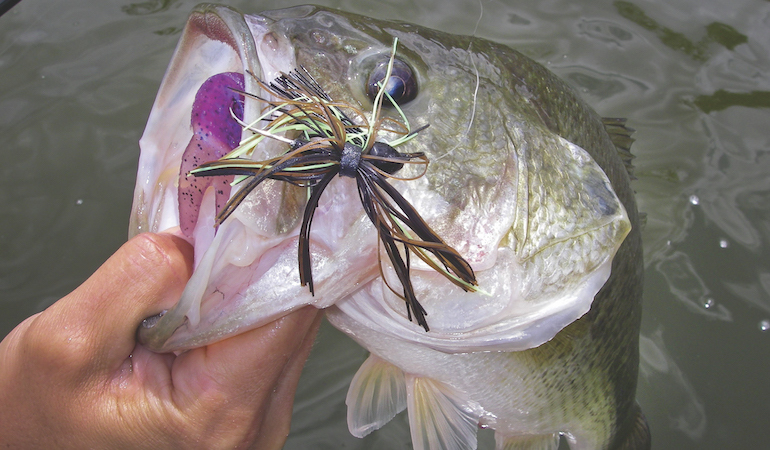 These bass eat everything … from various topwater baits to almost any soft-plastic lure or jig. And don’t forget the crankbaits and jerkbaits. North of Lakeside, San Vicente Reservoir in San Diego County stood closed from 2008 to 2016 while the dam was raised, and the lake literally doubled in size. It was a new place to everyone. Even between opening year and last year the water continued to rise, making it a “new” lake almost annually. Only the rains this spring will dictate if we all have to learn it all over again. Since it re-opened, the lake has produced a lot of 2- to 4-pound fish, and it’s fairly normal to catch fish in that range every visit. This is the only lake that approaches the numbers of bass an angler can catch at Barrett. San Vicente features all the classic bass-holding structure — shoreline brush and stickups, submerged trees and bushes, and a ton of granite boulders, some as big as houses. None of the brush was cut back when the lake was refilled, so the natural cover extends out to about 100 feet deep. Toss almost anything in the tackle box and expect to catch fish. One of the local tricks is to throw weightless Senkos, so they can be jumped across the tops of the brush. Passing bass will attack them, and you will definitely know when you are bit. It’s a catch-fest when the spring spawn brings bass to the San Vicente’s shallows. Throw anything, from crankbaits to spinnerbaits to soft-plastics, but always remember, larger plastic worms do catch larger bass. Watch for mudlines where the wind churns up a shoreline and run a jerkbait; bass often attack it the second it hits the clear water. Summer and fall bring a lot more topwater action on anything from frogs to popping lures to walking baits, like a big Zara Spook. Fisheries biologist Russell Black of the California Department of Fish and Wildlife told me fish surveys conducted on the lake before it re-opened produced bass as big as 9.5 pounds. Last year, anglers caught many bass in the 5- to 10-pound range, and 2019 may be the year for several 10-pound-plus fish to hit the decks of bass boats. It’s only a matter of time before this lake becomes the No. 1 bass fishery in Southern California. Although the water level at El Capitan Reservoir is down, bass fishing at the lake north of Alpine in San Diego County is not “down and out.” While tournament anglers find plenty of 4- to 6-pound fish, 1- to 3-pounders keep the action remarkably consistent. Springtime fishing commonly produces some nice 8- to 10-pound fish, proving the bass eat well upon the lake’s healthy population of shad. With all the streams that run into it, El Capitan rises readily every spring. As the level comes up, male bass roam the banks. They love the shallow cover in this lake, and if there is brush in the water, which there is most of the time, don’t be afraid to go in after them. Last year, a great “frog” bite produced a lot of bass in the shallow brush. Drop-shot and split-shot rigs armed with soft-plastics also score, as do spinnerbaits and crankbaits. The fish gather in numbers come summer and fall, creating “boils” of bass, when they’re foraging on large schools of shad and will take almost any lure. Some favorites include Little George, Whopper Plopper and small, darter-head worms. In southern San Diego County, Lake Otay, about 10 miles east of Chula Vista, arguably has been SoCal’s most consistent bass producer for the last several years. Its stable water level supports a good population of 1- to 3-pounders. Every spring, Otay turns out the 8- to 10-pounders it’s well known for, as well as some “teen” fish. In fact, it’s more likely than most SoCal lakes to produce double-digit bass. A tad on the smaller size, Otay can get crowded, but if you can escape on a Wednesday to fish, you should have a lot of lake to yourself. Trout-patterned swimbaits call up the big female bass in early spring, as they wait on outside points to move in for the spawn when male largemouths crowd Otay’s shorelines. Everything works in the spring, from soft-plastics to crankbaits to soft and hard jerkbaits. Once the tules return, bring back that old flipping stick you haven’t touched in a while. The bass love the cover here. Frogs were the flipping bait of choice for big bass last year. One of Southern California’s largest lakes, Diamond Valley Lake in Riverside County, 8 miles south of Hemet, has seen its bass fishing for several years go “up and down” across lake closures and openings, but it is still one of the best fisheries in Southern California. Give it a try. You won’t be disappointed. The lake-record largemouth weighs a little more than 16 pounds, but Diamond Valley likely holds bigger bass. Its largemouths came from stock from Lake Hodges in San Diego and grow large with the help of the lake’s stocked-trout diet, possibly to world-record proportions. The biggest bass will eat imitation trout swimbaits, especially the larger lures. It takes a little patience and some endurance throwing big swimbaits all day, but you may be rewarded with a personal best bass. Diamond Valley holds all the natural structure you could want to fish, along with humps and manmade structure set around the lake. Springtime brings thousands of males to the banks, building nesting sites, producing what can be the wildest time of the year to fish. Drop-shot soft-plastics, crawl Texas-rigged worms, or jump Carolina-rigged creature baits. Two dam faces, covered with giant boulders, hold fish year ‘round where both jigs and crankbaits can produce fast action. Summer and fall can bring early morning topwater action. Soft or hard jerkbaits will also work well this time of year. Lake Perris, about 10 miles southeast of Riverside, was drained down to a mud puddle not long ago for dam repairs, but it started filling again in early 2018. According to local fishing guide Todd Kline of San Clemente, the CDFW and the California Department of Parks and Recreation took great care while the lake was low to rebuild the fishery by adding cuts, rock piles and brush and trees around the lake for habitat for the bass. Perris’ bass-fishing history boasts a lot of giant largemouths, with an 18.80-pounder leading the way. Double-digit bass have been common in the past, making the revitalized lake a “sleeper” bass fishery for 2019. Trout are still stocked here, and trout-type swimbaits could produce the larger trophy bass. If there is a lake that could turn out a world-record largemouth over the next several years, it can be this one. Perris’ water level stood at about 80 percent of capacity in fall 2018, already covering a lot of brush. Springtime bass should work their way into the shallow brush for spawning. Don’t be afraid to throw right into the brush, as the 2018 stock of bass used much of this shoreline cover for protection. Drop-shot or split-shot fishing with soft-plastics do well around the new rock piles, as should crankbaits. Summer and fall will bring topwater action to the lake. The lakes of the Southland carry a long history of great bass fishing in both the number of bass an angler can catch on any given day, as well as the potential for posting double-digit bass. But Southern California’s weather – more specifically, it’s rainfall pattern — produces the greatest impacts upon local bass fishing. Full lakes draw more bass to the shallows, especially during the spring spawn, and those days are upon us. What will bass fishermen use to catch their giant bass on Southern California’s best bass lakes? The Whopper Plopper from River2Sea was a go-to bait last year. A cross between a hard topwater bait and a buzzbait, it churns as it works across the surface. The Hollow Body Craw from LIVETARGET is just that — a hollow-bodied lure molded similar to a frog, but created as a jig-type bait. The soft, hollow body lets the bass crush down on it for a realistic feeling that causes the bass to hold on to it longer, improving anglers’ hook sets. The bait comes in a variety of colors and has been selling out for the last year since it won a Best in Category Award at the 2018 ICAST Fishing Show. Zako swimbait from Gary Yamamoto Custom Baits is an innovative and versatile, soft-plastic, shad-shaped lure that can be fished weedless by itself, rigged for drop-shotting, flipped, or used as a trailer on a jig or chatterbait. Its special molding gives it an amazing action in the water no matter how it’s rigged.